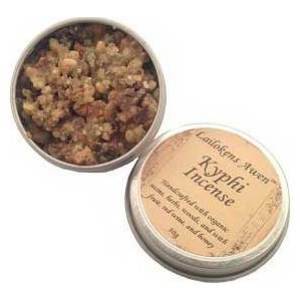 Kyphi is a compound incense that was used in ancient Egypt for religious and medical purposes. The earliest reference to Kyphi is found in the Pyramid Texts, a collection of religious texts dating to the Old Kingdom. The oldest of the texts have been dated to 2400-2300 BCE. Burn to invoke Egyptian Gods and Goddesses, during night rituals, and as a general magical incense. Made on the day and in the hour of the Moon. Organic, Handcrafted 30g tin.